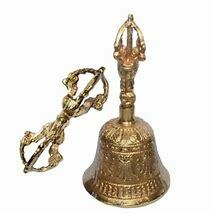 This feng shui bell is Vajra Bell. Vajra is one kind of the treasures in Tibetan. Vajra is called Dorje in Tibetan. Vajra represents the positive of Prajna Paramita. The Vajra bell makes the nice sound when you shake it. Dimension:Material: It is made of brass.